Solution Saddles Customer Stories: Sharon Savory and Josh are having great fun in their SMART saddle and looking forward to moving up a level next season. 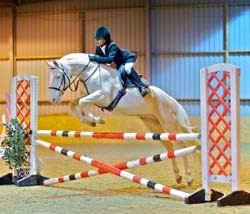 Sharon Savory and Josh are having great fun in their SMART saddle and looking forward to moving up a level next season. 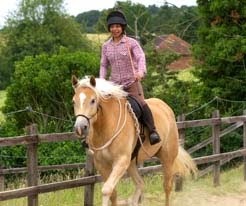 “Oxnead Appleby (aka Joshua) is a tall Haflinger who stands at about 15.3hh. I was having issues with Josh going forwards, he was starting to do mini bucks in transitions and I worked out that he was filling out and his saddle was the cause. I felt stuck, I had had the saddle checked and it looked to fit but clearly he was still unhappy and unable to move freely. My friend came over with her Solution saddle and suggested that we tried it. I was sceptical at first but gave it go. Well, a different horse indeed! No ears back; no bucks and moving forward freely. That was it! I arranged a Home Consultation Visit from a Solution Saddles Approved Advisor and I decided on a SMART NATIVE GP for Josh and a SMART POPULAR GP for my other horse. Since then, it has been plain sailing. Josh is now six and has changed shape a lot over the past two years and the SMART saddle has allowed his muscles to grow and strengthen without any interference. 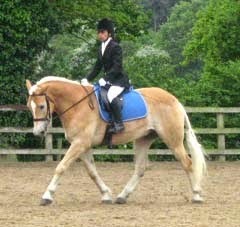 We have lovely comments from dressage judges about how flexible and soft his movement is. I love being able to feel the movement through the saddle, which has improved my balance and riding no end. 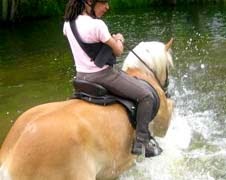 I find it easy to stay with him, even when training a young horse which is learning to balance, bend and jump and things go slightly awry! I am only 5' tall, 7.5 stone and have short legs; this has made no difference as I am able to use my seat a lot more and feel my way through. 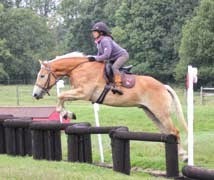 Josh is now competing in ODE's at 80 cm and training at 90 cm. His jumping is freely and easily as he is able to use himself without any restrictions and I don’t worry about the saddle pinching or digging in. He is so comfortable and confident in his work that I can really focus on the riding. As you can see from the photos, we do just about everything in our SMART saddle - horsemanship clinics, dressage, XC, SJ, hacks, pleasure rides, hunting. I love the fact that we don't have to have endless saddle fittings and I can adjust the saddle using shims and balance pads to adapt as necessary. They are so comfortable, light and easy to use, handle and ride in. We are having a great time together! I have absolute confidence in my SMART saddles; next year I am looking forward to moving up to training at 100 cm and having yet more fun! Sadly I lost my other horse but I was able to put the spare SMART straight on my loan horse, and away we went!"